Claire Savage writes about the rewards and responsibilities of self-publishing. Tony Canavan with the latest news from the world of books and books rights. John Quinn pays tribute to poet Francis Ledwedge on the 100th anniversary of his death. Edwin Higel reflects on 25 years of New Island. 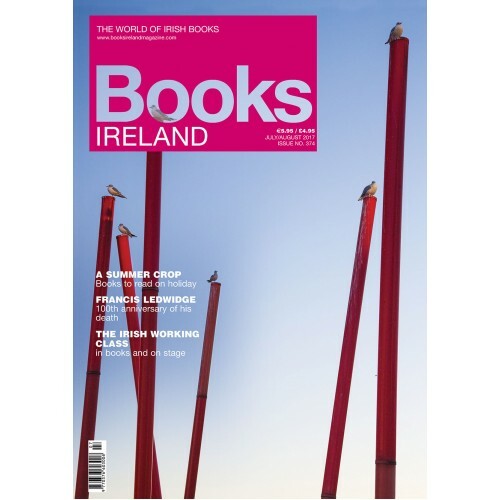 Michael Pierse examines how the Irish working class have been represented in literature. Bookshop Focus: Caroline Healy paints a word portrait of Louisburgh’s Books@One. Tim Fernée writes about the project to bring the eighteenth-century classic Melmoth the Wanderer into the 21st century. Camilla Dinkel, facing retirement, is looking for someone to take over the Dingle Bookshop. Behind the screen Tony Canavan on Liam O’Flaherty’s The Informer. A summer crop of books: Our choice of the best books to pack for your holiday at home or abroad. Livinia Greacen—The Long-winded Lady (notes from The New Yorker) by Maeve Brennan. Cathal Póirtéir—Seacht mBua an Éiri Amach/The Seven Virtues of the Rising by Pádraic Ó Conaire (Arlen House). Hugh McFadden—Virgil and Joyce: nationalism and imperialism in the Aeneid and Ulysses by Randall J. Pogorzelski. Louisa Carroll—Irish Cultures of Travel: writing on the Continent, 1829–1914 by Raphaël Ingelbien. John Gibney—Michael Collins: Dublin 1916–22 by Joseph E.A. Connell Jnr. Joseph Horgan—Austerity and Recovery in Ireland: Europe’s poster child and the great recession by William K. Roche, Philip J. O’Connell and Andrea Prothero (eds). Matthew Farrelly—A History of Running Away by Paula McGrath. Tony Canavan—Something in the Blood: the untold story of Bram Stoker, the man who wrote Dracula by David J. Skal. Fiona Murphy—Married Quarters by Shane Connaughton. Patricia Byrne—Irish-American Autobiography: the divided hearts of athletes, priests, pilgrims and more by James Silas Rogers. Caroline Hurley—The Clubhouse Mystery by Erika McGann. Hugh Oram—The Catholics: the Church and its people in Britain and Ireland, from the Reformation to the present day by Roy Hattersley. Cathal Póirteir begins his new column with his selection of recent books in Irish. Sue Leonard with the best of début fiction. Paula O’Hare checks out the crime scene. Jane Casey tells us why her list of favourite books just keeps growing.